Bay Physio provides treatment for ACC registered claims, insurance company claims and private patients. Doctors' referral is not required. If the disorder is due to an accident, we can register the problem directly with ACC. We also use the Easy Claim system for Southern Cross Insurance. All our physiotherapists are ACC registered. Please feel free to bring your family support members/whanau. Children are welcome. Thorough clinical assessment and diagnosis. Clear treatment plans focused on your long term health and wellness. Skilled manual therapy techniques - joint mobilisation and manipulation. Soft tissue massage / release techniques and trigger point therapy. Acupuncture, acupressure and dry needling. Tailored home exercise prescription and functional rehabilitation. Sport and work injury prevention screening – strength testing & movement pattern screening. 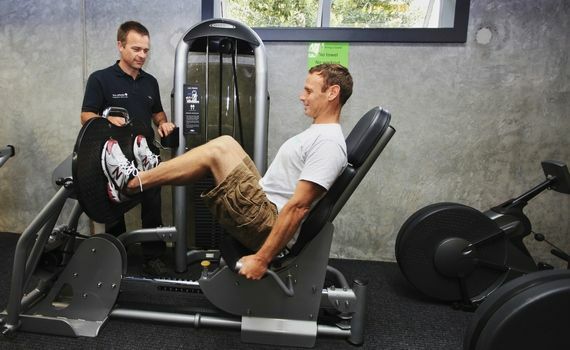 Gym rehabilitation & strengthening programmes. Clinical Pilates instruction & spinal strengthening programmes. ACC : pain management and return to work programmes. Chronic disease management for diabetes & arthritis. X ray and scan referral. Work place and work injury assessments. Reminder text messages are sent the day before all appointments. Please arrive 10 minutes prior to your initial assessment to fill out the registration form. Appointments take approximately 30 mins, longer for complex cases. Your long term health goals will be identified within the first few sessions and a suitable treatment plan will be discussed and agreed upon. Follow-up sessions are scheduled based on the treatment plan. Payment is expected on the day of treatment (eftpos,cash,cheque). To ensure accurate treatments, the injured body site will need to be accessible. Gowns and shorts are available to use, however patients are encouraged to bring appropriate clothing. Male and female physiotherapists are available if you should have a preference.